Are you looking for a good reverse osmosis filter that won't cost you an arm and a leg? The RO5DX 5 Stage Reverse Osmosis System from Express Water is one of my picks for the best reverse osmosis systems of 2017. Like the rest of the top rated systems, it does a fantastic job of removing contaminants and making drinking water taste fresh and clean. ​But it's a good bit less expensive than the others. If you want a good RO system but you're on a tight budget, I think it would be worth your while to take a closer look at the RO5DX.​ It might just be what you're looking for. ​Click here to find the latest price and availability of the Express Water RO5DX at Amazon. This review will cover the RO5DX's features and answer questions you might have about its effectiveness, cost, warranty, reputation, and more. I've also included a video a little way down the page that shows what's included in the system. If you're pressed for time and don't want to read my whole review, you can skip to what interests you most in the quick navigation below. How does the Express Water system work? What contaminants does it remove? ​What comes in the box? How much waste water does it produce? How do you know when it's time to replace the filters? Does the RO5DX remove beneficial minerals from the water? Where are Express Water systems made? Fast flow rate of 0.8 gallons per minute means getting that spaghetti pot filled up pronto! Like all reverse osmosis systems, the Express Water works by the force of the water pressure in your plumbing system. There's no electricity involved. The water goes through a series of 3 pre-filters before it's forced through a reverse osmosis membrane. This membrane allows clean water molecules to pass through, while contaminants are blocked and go down the drain. ​After passing through the ro membrane, the filtered water goes into a tank where it's stored until you turn on the faucet. Check the current price and read the reviews at Amazon. 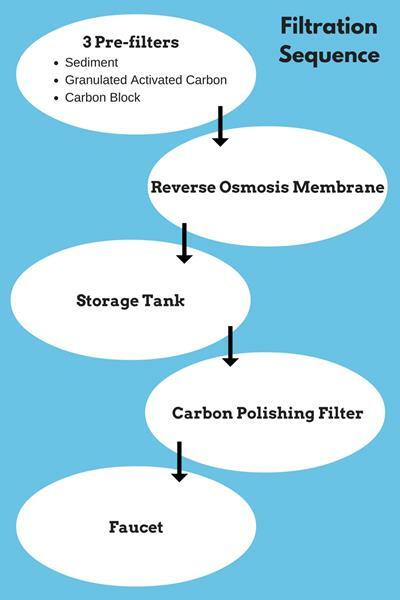 Different contaminants are removed at each stage of filtration. First, the sediment filter captures particles like dirt, rust and sand. The reverse osmosis membrane blocks contaminants like pesticides, bacteria, viruses, fluoride, chromium-6, heavy metals, and TDS. The final carbon filter is also known as the "polishing filter​". It takes out any last traces of bad tastes or odors that the water might have picked up in the storage tank. Total Dissolved Solids (TDS) are dissolved salts, minerals and metals that get into the water from rain and runoff. Right now they are also including an extra set of replacement filters, so you're good for at least a year. Another added bonus is a free leak stopper, which shuts off the system if it detects a leak. ​You won't have to worry about waking up or coming home to a flooded kitchen. Please note that the extra filters and leak stopper are limited time offers. They are still being included at the time of this writing. Check at Amazon to see if the offer is still valid. Most people find it pretty easy to install themselves. But, some have said that the printed instructions aren't the easiest to follow. What's funny is that others say they're clear! I guess it depends on whether you have previous plumbing experience. At any rate, if you have trouble, you can call Express Water customer support and they'll be happy to help you out. I looked for Express Water installation videos on YouTube, but I couldn't find any. There are several showing other brands, though, that could be helpful. Installation doesn't vary much from brand to brand. The tank is metal with a butyl rubber bladder. Everything that the water touches throughout the system is lead free and BPA free. The typical ratio is 4 gallons of waste water per 1 gallon of filtered water. This can vary, depending on the temperature and pressure of the input water. The life of the filters depends somewhat on the quality of your input water and on how much you use it. The manufacturer recommends replacing the filters every 6 months, regardless of the taste. Part of the job of the pre-filters is to keep debris from clogging up the reverse osmosis membrane. Also, after 6 months you could have bacteria growing in the carbon filters. You don't want either of those things to happen! The RO membrane should last for 1 year if you change the pre-filters on time. You can buy replacement filters either from the manufacturer or other online retailers. There are different size packs available. You can save yourself a lot of money by buying a 2 year supply as opposed to a 1 year supply. Click here to find the latest price and availability of Express Water replacement filters at Amazon. Yes, all reverse osmosis systems take out all of the minerals, including the good ones. This results in water that is slightly more acidic. That's not a problem for most people, but some prefer more alkaline water for the taste or because of health concerns. Express Water does have an RO system that adds minerals back to the water as part of the filtration process. It costs about $20 more for this option. ​You can check the availability of the Express Water Model ROALK5BN with Remineralization at Amazon by clicking here. The systems ship out of California, but where the parts are made remains a mystery to me. A couple of reviews I read said that the parts are stamped "Made in Taiwan". I emailed the manufacturer requesting information, but I haven't heard back from them yet. When I do get an answer, I'll update it here. Express Water offers a 1 year warranty from the time of purchase. It doesn't apply to the consumable parts, like the filters, membrane and tank. The Express Water RO5DX seems to be just as effective at removing contaminants as the more expensive brands. It's known for making great tasting water and for being easy to install and maintain. The only negative is that it appears to be made in Taiwan, where the other major brands are made in America. To me, that's not a deal breaker. But you may feel otherwise. I think this would be a good choice for someone who wants to try out a reverse osmosis system without sinking a lot of money into it. It has a one year warranty and the customer service has a good reputation, so there's really no risk. 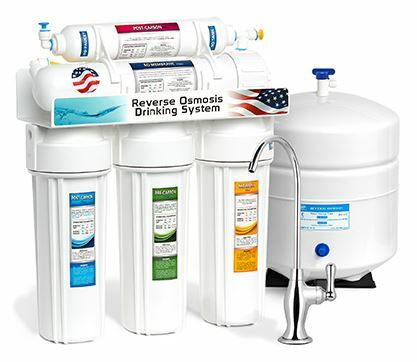 You can order an RO system for yourself today and have access to pure healthy water in your own home. Click here to go to Amazon and check the current price and availability of an Express Water RO5DX. If this system doesn't seem like the right fit for you, please see ﻿﻿﻿my review of the best RO systems for other options. Not sure what kind of water filter you need? Top 25 Questions About the Big Berkey Water Filter – Answered!